For when Mick Box decided to offer the vacant position to ex-Grand Prix, Praying Mantis and Stratus vocalist Bernie Shaw, it was a move that was to pay the highest dividends. Box had checked Shaw out at Stratus' farewell performance at the Marquee, on the advice of Heep and former Grand Prix tour manager Howard Menzies. "It was like everything falling into place", says Mick. Shaw remembers covering Heep songs during in his early days with Cold Sweat in Canada. "I felt honoured at being invited to join such a legendary band", he says. And so there was a new found optimism during 1987. Once again there was a definite feeling within the camp that here was a line-up that had a certain something about it. Things had taken an about turn behind the scenes too, as Heep had severed their old management connections the year before, linking up with the Miracle Group of Companies for business management. "I'd known the band for several years," says boss Steve Parker, "and had always been impressed by their tenacity. When the opportunity arose, I didn't need to think twice." The real difference, however, between Uriah Heep and so many other bands who have built up large histories, is one of attitude. It would have been easy to stick to established routines but Heep have always tried to extend their horizons, visiting new countries and experimenting with new ideas. But if ever the band had started to think that perhaps they really had done the lot then the events towards the end of the year were to change not just that particular thought but quite possibly the course of their career as well. Heep had ventured into most of the Iron Curtain countries, and had returned for more, but in late '87, with Miracle now also their agents, an even more challenging prospect was to loom on the horizon - Russia. Up until this point, the USSR had been considered strictly out of bounds, for heavy rock bands anyway (with only the likes of Cliff Richard, Elton John and Billy Joel having played there), though 'July Morning' had somehow managed to establish their name over there in the late Seventies. However, in the wake of glasnost and perestroika, the attitude of the Soviets had started to change, and it was Hungarian promoter Laszlo Hegedus (a close contact of Miracle) who was to help secure the deal; Uriah Heep had been invited to become the first Western rock band to play in the Soviet Union, land of Stoli and caviar! The history making concerts at Moscow's Olympic Stadium, where the band played to a total of 180,000 people across ten consecutive nights (following a welcoming reception that Bernie remembers as being "something like Beatlemania"), represented not just an achievement for Uriah Heep but a major breakthrough for western music in general, opening the door for the likes of the Scorpions, Bon Jovi, Status Quo and Motley Crue. "We were so aware of being ambassadors of the West," Mick Box told Music Week shortly afterwards. "If we'd have gone there and created rock and roll havoc it could have been (Iron) curtains for other bands wanting to go, excuse the pun. We were definitely testing the water." More significantly, however, the event became the launching pad for the new line-up, the concerts being recorded and subsequently issued in the form of the commemorative Live In Moscow album (their first release for Legacy Records - incidentally their third live recording of their career, following the million selling Uriah Heep Live (1973) and the release of Live In Europe 1979, featuring John Lawton and finally put out by Castle Communications in 1986). The most notable thing about Live In Moscow is the inclusion of three new tracks, the impressive 'Mr. Majestic' (a Phil Lanzon composition) among them. "It was important to let people know exactly where we were at musically", explains Box. The writing relationship between Box and Lanzon was already beginning to gel, though as Phil says, "I don't consider myself to be Ken Hensley's replacement - I just happen to play in a band called Uriah Heep". In Britain, in particular, the media got rather excited by the Soviet excursion, serving to re-establish Heep's name. "It's funny", Box told Kerrang! 's Paul Henderson (who also supplied the LIM sleeve-notes). "Because our profile hasn't been that big in England recently some people think that we�re dead and buried. But in the last 17 years there hasn't been one year where we haven't toured extensively". And that's exactly what they had been doing. Indeed their touring schedule reads like something from Around The World In Eighty Days, with Heep subsequently following up the Soviet dates with three sell-out concerts in Czechoslovakia (the first Western rock band to play there), four sell-out shows in East Berlin, and then becoming the first Western rock band to tour Bulgaria, spreading the word to another 80,000 people. They then returned to Britain for the Reading Festival in August of '88, winning much acclaim ('Band of the day' said RAWs Dave Ling, and he wasn't wrong), before following up with a UK tour with sleaze merchants The Dogs D�amour in tow. "I love the road", says Bernie Shaw. "I just can't get enough of it". Wich is just as well, when you think about it! But if emphatic proof of Uriah Heep's re-emergence was required then that was to come with the new Raging Silence album, recorded and mixed over a couple of months in London and released in May 1989. "We immediately wanted to get Ashley (Howe) in to produce", says Mick, "but he had some commitments so he came over (from his NY residence) for pre-production and introduced Richard Dodd to us (who'd just done a great job with George Harrison's Cloud Nine album and with The Traveling Willburys). He brought a freshness, he brought the live power onto record and I thought he enticed out of Bernie a lot of different styles. I think Bernie learnt a lot from him and I was very pleased to see the whole thing grow. And hopefully that natural growth will be reflected on the next album too". Shaw looks on the recording of the album as one great learning experience: "I�ve never learnt so much in so little time. They brought a lot out of me that I didn't even realise I had". Perhaps the most stunning feature of Raging Silence is its contemporary freshness. Between Howe, Dodd and the band they grabbed Heep's traditional character by the scruff of the neck, sprinkled it with a high-tech seasoning and emerged with one of the year's best hard rock albums. In 'Blood Red Roses' (written for the album by Peter Goalby) they had vibrancy, urgency and commerciality; in 'Cry Freedom' they had a rock solid winner inspired and inspirited by their travels behind the Iron Curtain; in 'Hold Your Head Up' (the old Argent hit) they displayed bravery with a touch of verve; in 'When The War Is Over' (previously a hit at home for Australia's Cold Chisel and Little River Band) they had an emotive ballad full of hope and optimism; the list goes on ... The press, too, admired the way in which this particular Heep held true to its traditional values while displaying a vision of tomorrow". That stems from a conscious search for new ways of doing things", says Box. "It gets harder but you have to keep striving for that. We're attracting new fans all the time, indeed for some people Raging Silence will be the first Heep album they've heard and then they'll discover that there's a whole history to us". Raging Silence was followed by a return to the Soviet Union, this time providing a musical education to 100,000 people in Leningrad, then a visit to Wroclaw in Poland, six concerts in Brazil, a free concert in East Berlin (in front of another 80,000 people), dates in Britain (the performance at London's Astoria being captured on the Raging Through The Silence video, courtesy of Fotodisk, living proof of how comfortably the likes of 'Bad Bad Man', 'More Fool You' and 'Blood Red Roses' sit alongside the old favourites), tours of Greece, Spain, Finland and even a visit to Estonia, making it a total of 38 countries to have been touched by the strains of Mick Box's immediately identifiable guitar. "I�ve only had my passport a year and I only got two free pages left!" exclaims Shaw, while Lanzon is just as enthusiastic about the band's travels. "It's now established that Heep will continue to cross borders; who knows, for maybe another twenty years". And America will soon be welcoming the band back to its freeways. "I�m sure we can go there and take it to the limits", says Kerslake. It says something about the spirit within the current band when Trevor Bolder says "the last two years have been the most enjoyable of all my time in Heep". 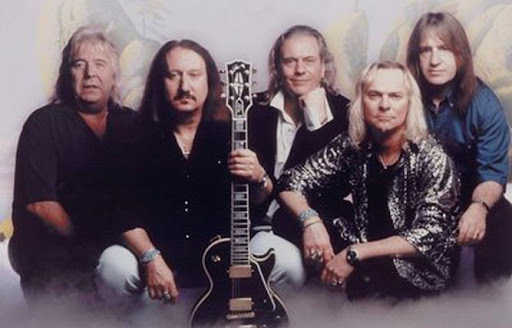 Towards the end of the year, as part of a hand-full of UK dates, Uriah Heep played in the Central TV studios in Nottingham, the film was shown as part of the Independent TV series called Bedrock and a few years later, was repeated in the Cue Music series. A video of the concert was also released in 1990 as part of Heep�s 20th Anniversary celebrations called Live Legends along with a three CD box set of classic Uriah Heep tracks entitled Two Decades In Rock. Also released was a cut down version of the Live Legends soundtrack for CD titled Still 'Eavy, Still Proud. Unfortunately, the only UK gig of this anniversary year was at the annual bikers festival, The Bulldog Bash. As there was little promotion outside the bikers clubs who organised the event, very few real Uriah Heep fans were in the audience. Although Uriah Heep were to have a stable band once Shaw and Lanzon had joined, recording deals that were satisfactory for the band were far from abundant. In fact, between 1986 and 1995 they were to only release three full studio albums and one prime live set. The band toured constantly however, even if UK fans were beginning to call this era of the band's career 'The Wilderness Years'! Work began on a new album in 1990 but with tours in North and South America and several festivals in Europe, the band were constantly in and out of the studio and consequently the album release was delayed. Richard Dodd (producer of Raging Silence) was unavailable, so Trevor Bolder assumed the production responsibilities. Released early in 1991, Different World got a mixed reception from the press, Chris Watts overlooked the music and resorted to personal insults in Kerrang!, Andy Bradshaw wrote in Metal Hammer: "What a surprise this one is! Heep bassist Trevor Bolder should produce all their albums in the future". Concluding the review he went on to say: "Different World is a very strong album indeed, containing quality songs, immaculate arrangements and heeps of appeal". The release coincided with Uriah Heep�s biggest UK tour since the 70�s, equalled only by the Equator tour 6 years earlier, once again they were dogged by poor promotion from the record company with terrible presentation in the artwork, consequently the album disappeared without a trace. After completion of the Different World album Uriah Heep were to end their association with Legacy Records. The band however continued to tour in many territories throughout the world including Continental Europe, North America, South Korea, Eastern Europe and Japan. Countless compilation releases have flooded the market in recent years but the only ones to offer anything other than previously released material were Rarities From The Bronze Age, an excellent CD of singles and B sides previously unavailable on CD, and The Landsdowne Tapes which features previously unreleased material from the early 70�s during the period when Gerry Bron first took Spice into the studio through to the Look At Yourself era. Uriah Heep did return to the studio to record 5 tracks in August 1992 to aid their efforts in obtaining a new recording contract. Anxious not to be saddled with another record company who were not 100% behind them, they have been very selective and therefore did not enter into deals that were readily available. In 1995, Uriah Heep celebrated their 25th anniversary moving through to 1996 are as solid as ever. The line up of Mick Box, Trevor Bolder, Bernie Shaw, Phil Lanzon and Lee Kerslake spans over a third of their history and is the longest lasting of all. Mick Box may be the only ever present member but Lee Kerslake has been around for all but a couple of years, Trevor Bolder has played bass in Uriah Heep for almost three quarters of the band�s career, Shaw has been the longest serving of all the vocalists and Lanzon�s time on keyboards will by 1996 be equal to Ken Hensley�s time in the band. They worked very well together in that times than any of the previous line ups and their latest album, Sea of Light has been hailed as their best since the days of Demons And Wizards and The Magician�s Birthday. This box set contains 2 demos from the sessions prior to the latest album along with the track 'Time Of Revelation' - a song not unlike some of the great rockers from days gone by. Uriah Heep have indeed had an eventful history, with both successes and set backs, there can be no doubt however on the impact and influence they have had in the development of Rock Music. They are a band that are very 'eavy, very 'umble and very very good. September 14 of 1998 'Sonic Origami' is released, a brand new album produced by Pip Wiliams. The band did a very succesfull tour in Europe, 45 countries were visited by the king of the road. A planned US tour in the autumn of 1999 was cancelled. Heep just carries on and in november of 1999 a new tour in Europe was done. The new century started off with lots of gigs all over Europe. In the year 2002 Uriah Heep is more active then ever. 30 years of rock resulting in stunning DVD's called The Legend Ccontinues, Acoustically Driven and the rockumentary Sailing the Sea of light ... live CD's: Future Echoes Of The Past and Electrically Driven. In 2001 the band had a sold out tour in the UK. A reunion gig took place in London on December 7th, 2001 with Ken Hensley and John Lawton. The Magicians Birthday's Party was the first celebration of Heepmusic that had turned into a Heep-tradition. Heepfans come to London every year to enjoy the band and guests. In 2004 the event was held at the Astoria. November 6th 2004 the Magicians Birthday Party took place at the Shepherds Bush.